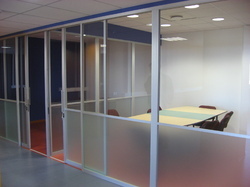 Our enterprise is actively engaged in providing our clients a wide range of Aluminium Partition for Offices. We deliver these aluminium partition within stipulated time frame to the end user as well. Keeping track of contemporary market development, we are devotedly occupied in providing an extensive series of Aluminium Partition. We are engaged in offering a superior quality Windows Partition. These are widely used in residential and commercial purposes. They ensure safety and privacy of the occupants more effectively. We ensure to manufacture these by using the most advanced technology and the best available raw material.